With the shift towards the importance of institutional allocators in the hedge fund industry, there has come more of an emphasis on the operational infrastructure and resilience of the fund management firms allocators invest with. Start-up and established hedge funds are finding that they have to allocate more of their budget to ensuring their firms measure up to increasingly stringent operational and systems criteria if they are to win and retain institutional mandates. Eze Castle Integration, which won the award for Leading IT Infrastructure Provider from The Hedge Fund Journal this year, has been ably demonstrating what can be achieved if new technologies that have become more widespread in the last four years are applied to hedge funds. It is an exciting time to be working in the hedge fund technology space, as hedge funds, with their small staff base and entrepreneurial cultures, are able to take advantage of such opportunities quickly. Eze Castle has been promoting a cloud-based approach to operational integration, employing its secure and geographically diverse data centres, coupled with a highly scalable approach to systems implementation. Just as you might pick the apps you want to use on your iPad, so Eze Castle argues that hedge funds should be able to pick the ready-to-deploy technologies they need in a format that is swift and cost-effective to implement. With this comes the firm’s tried and tested on-site support coupled with 24-7 international help desks. It will be music to the ears of embattled COOs wondering how they will meet new operational agreements within budget. Eze Castle has been providing a Eze Private Cloud for five years now, and has a little over 2000 users of this service. It has over 60 applications and employs two data centres in the UK, four in the US and two in Asia. It has grown significantly with substantial investment from Eze Castle, and leverages technology from the likes of VMware, Dell, Cisco Systems and NetApp. 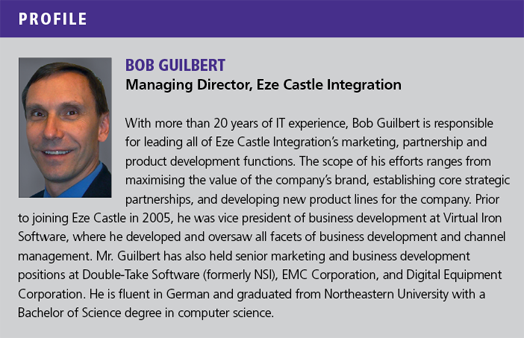 “When you work with a private cloud provider you get the benefits of management, security, scalability and disaster recovery,” says Bob Guilbert, managing director at Eze Castle Integration. Clients of Eze Castle’s Eze Private Cloud have the flexibility to dynamically add applications into the environment with additional disaster recovery support for each application. This includes Microsoft back office applications, order management, portfolio management, risk and CRM systems. Much will depend on the fund’s trading strategy and the tools needed to support it, but the choice lies entirely with the fund manager. The cloud-based offering from Eze Castle really grew out of the demand for disaster recovery environments from hedge funds. “We would mirror [hedge funds’] entire production environment, hosting anything they had in production including all their applications,” explains Guilbert. Eze Castle also works with third-party vendors like Advent to host their applications in the cloud. Two years ago several key software vendors carried out certification processes to ensure that third-party cloud providers like Eze Castle were up to the mark when it came to secure hosting of their technology: some vendors will not allow their applications to run on just any cloud – they need to ensure such facilities meet stringent security criteria, for example. Standards have to be higher than in ‘retail’ clouds if expensive third-party software is to be hosted. The Eze Private Cloud is split into the Eze Managed Suite (Microsoft productivity products with connectivity to mobile devices, including file and back-up services, and built-in disaster recovery) and Eze Managed Infrastructure (a completely customisable environment designed for hosting). The latter allows for hosting of customised systems and applications a hedge fund might have developed in-house. Since 2008 hedge fund firms, like many other financial institutions, have remained cost-conscious, and really only want to spend money on the technology they have to have. Cloud computing allows businesses to reduce their capital expenditure in the IT silo while increasing operational costs and thereby enjoying significant tax benefits. On top of this, there is less of a concern about maintaining in-house communications rooms or data farms, as a cloud-based approach brings the pay-as-you-go software as a service technology model with it. and its presence as part of a hedge fund’s operational infrastructure will help to reassure prospective clients. Eze Castle’s services canbe tailored to a range of fund sizes and are not simply designed to support the big multi-strategy managers. While bigger hedge funds typically have their own internal infrastructure, a cloud-based environment can add value across the spectrum, regardless of the size of the operation. Accurate pricing in this respect stems from a clear picture of a fund manager’s IT needs, based on which applications or services he is using and how many people are using them. More computing resources can then be added seamlessly as and when there is a requirement, including servers, storage and bandwidth. One other advantage that a private cloud-based model yields is the fact that different systems are often already integrated, thereby avoiding headaches that occur for a fund if one third-party software system does not want to talk to another. Bringing a new system in-house can take months of road testing before it works properly, consuming hundreds of man hours and creating a distraction for a lean investment management firm. A private cloud-based model gets around much of this from the start, avoiding many of the nightmare stories one hears from managers who were starting their firms 10 or more years ago. Guilbert also points out that much effort has been expended to ensure client data is isolated, with multiple steps required to authenticate who has access to client information, and how it is logged, recorded and audited. As regulators become more focused on historic record keeping when inspecting funds (and we are seeing this increasingly in the US market from both the SEC and CFTC), the ability to demonstrate robust back-up off-site is becoming less of a nice-to-have and more of a must-have. Last year Superstorm Sandy opened eyes once again to the need for appropriate disaster recovery solutions, both in the fund management and the investor communities. The SEC and FINRA have even been polling hedge funds in the wake of the storm to see how firms coped and whether or not clients were compromised in any way. There is obvious concern amongst financial regulators that the entire investment management industry be robust enough to deal with unforeseen occurrences. not all disasters happen like this. A fire or a burst pipe can’t be planned for – you have to be able to react regardless. There is a definite shift within the alternative investments industry towards the use of the cloud, as there is within the broader business world. Eze Castle’s Guilbert estimates that 30% of hedge fund firms in the US are now making use of the cloud in some capacity and sees that trend swinging rapidly towards the 50% mark in the next couple of years. Eze Castle will no doubt remain at the forefront of this trend.